The annual International Legal Alliance Summit & Awards is coming up! 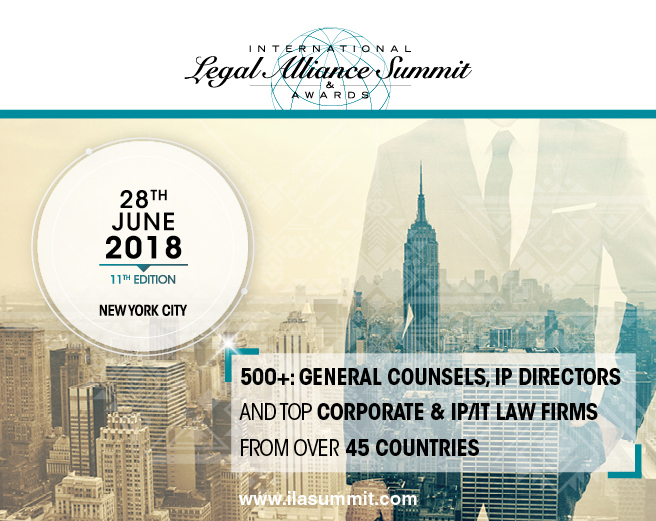 This unique event brings together more than 450 senior representatives from leading Law Firms as well as General Counsel from more than 40 countries to discuss, network, debate and reward the key players of the sector. Be part of ILASA’s history by joining us at the 11th edition of the International Legal Alliance Summit & Awards, in New York City on June 28, 2018. Enhance your international referral network, build new alliances. Take part in the 1,200 One-to-One Meetings. Meet your peers from around the world. Build a network of the best international legal advisors. 500 attendees, the opportunity to meet the best performers of the legal community. 120 jury members: General Counsel of Fortune 500 + companies. 2 tracks of interactive panel sessions dedicated to advisors, lawyers and general counsel. Share your expertise: be part of the « Expert Insights » panel sessions. Special focus in M&A, IP and cross border deals.